Mix together and leave overnight. ( I left it for 8 hours in my 30C kitchen and it was ready when I got up in the morning). Kneaded until medium windowpane (slightly more than Arlo in his original post) and let it ferment for 2 and a half hours with folds at 50 mins and 100 mins. That was followed by a pre-shape, a 15 min rest and a final shape. It rose for an hour, got banished to the refrigerator (again out of necessity) and was taken out 3 hours later to complete its proofing. It was baked for 10 mins @ 230C with steam (fan off) and then for 40 mins without steam (fan on). 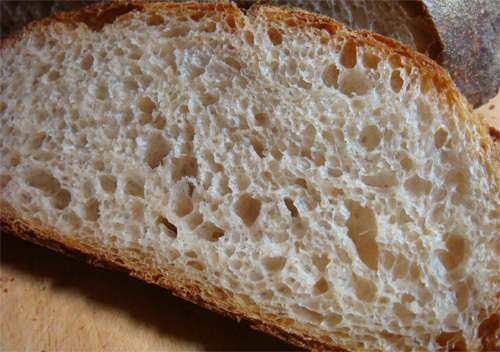 A close up of the crumb. I am glad I made this one immediately as it might have stayed on my 'to do' list for a long time and it is too good to be relegated to that kind of fate. I. WILL. BAKE. THIS. SOON!! The original post by Arso was enticing enough, but now it's you! :p I need to bake a couple of my faux-Poilane for my friend tomorrow, but after that, THIS I'm going to bake! Thanks for pushing sharing, Syd! The chestnut colour of the crust is absolutely swoon-worthy! ...and lovely crumb, too, of course! You won't regret making this loaf. It tastes really good on the second day. That crust has so much flavour. 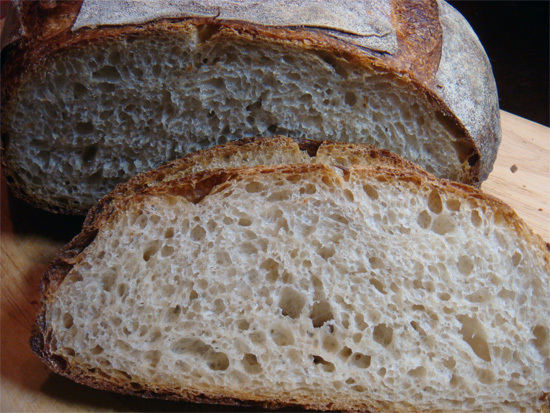 The crumb is tender but with a nice spring to it and has the perfect amount of sour for my tastes. I couldn't wait to get off work today and cut myself a chunk of it. No butter to adulterate it - just bread and some good cheddar. Heavenly! 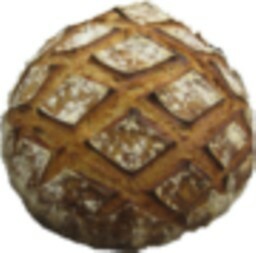 I haven't been so excited about a loaf since dmsnyder posted about the SFBI miche. Ordinarily I am not that fast, but I was really taken by this one and just had to make it. It so happened that I had a 5 hour break on Tuesday afternoon. I prepared the levain on Monday night, rough mixed it early Tuesday morning, bulk fermented, shaped and retarded it in the afternoon and then baked when I got off work in the evening. Here is a link to the rye flour I used. It is the only one I am able to get where I live. It is a very light rye as you can see from this pic. Lovely bread, Syd! you are quick :) you've achieved good evenly opened crumb and a beautiful crust color. It is a beautiful loaf! Arlo's recipe is worth trying. Thanks Arlo! Definitely worth trying. There is lots of flavour locked in that crust. Haha! Awesome, someone tried one of my recipes. Glad it worked well for you Syd. I brought this version up in conversation to the owner of the bakery I am at. She loved the idea but didn't know if having a rye starter on hand was feasible with the little amount of rye products we can fit into the schedule. So I guess I will just be making my variation at home, maybe until I open up my bakery one day not so far away. I think your loaf is excellent Syd. Glad that it worked for you. 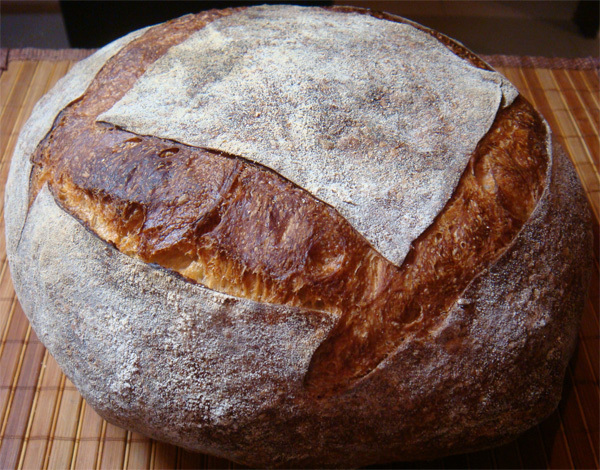 @Varda, for my loaf I used a local stone ground coarse rye. I am curious to to see what kind of rye Syd used. The crumb is very nice. I have always maintained that it is the biggest compliment someone can pay you: try your recipe and do it successfully. It means that you have a winning formula and that your instructions were accurate and clear. Thanks for an awesome loaf, Arlo. Actually, I don't have a rye starter. I just added 10g of my regular starter which is fed with 85% all purpose and 15% rye to 100g of flour and 100g of water. Worked like a charm. I don't have the space to keep a whole range of starters. If I were you, I would make one at home for your boss and see what she thinks of it. 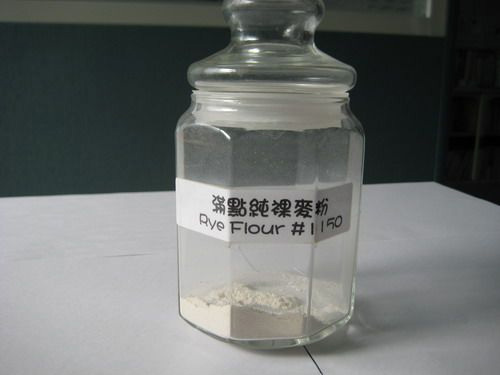 Tell her you don't need to have a special rye starter for it and that you can just use your regular starter. See what she thinks. This bread has an excellent flavour and there is magic in that crust. Here is a pic of the rye flour that I used. It is a light rye. Above, in my reply to Varda's comment you will find a link to the actual product. I'd say you've confirmed that arlo's bake wasn't a fluke but a winner! Congrats to you and arlo. Most definitely, yes, Larry. It is a winner. It is not often that a recipe works out the first time but what a pleasure when it does. That says a lot about Arlo's recipe writing skills. Also, that marvellous grigne and the colour the caramelisation has imparted. Beeyootiful! I haven't been so excited about making a loaf for quite a while. ...I would be excited too if I'd made a loaf like that! Love the crust and crumb! Thanks, breadsong. I can't wait to make this one again. Looks like I am going to have to wait a quite a while though. I am busy this weekend... unless I can sneak in a quick midweek bake again next week. Just finished the last slice before I sat down to the computer.